Golan Heights (AFP) - Druze on the Israeli-occupied Golan Heights on Saturday took to the streets in protest at US President Donald Trump's pledge to recognise the Jewish state's sovereignty there. Some remained, however, and today around 23,000 Druze -- an offshoot of Shiite Islam who also live in Lebanon -- reside in the Israeli-controlled sector, alongside 25,000 Israeli settlers. 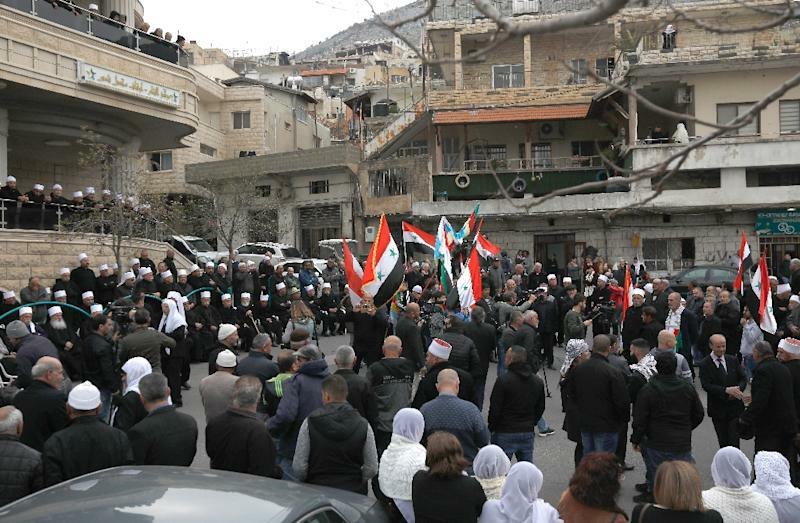 On Saturday Druze men, women and children rallied in the town of Majdal Shams, adjacent to the armistice line between the Golan's Israeli and Syrian-controlled sectors. Others carried banners in Arabic reading, "The Golan is Syrian" and "We are the ones who decide Golan's identity". "We reject the decision of the American president Trump because he is talking about something he doesn't own," he said in Arabic.